This pap boat is decorated with the Seaweed sheet pattern, which was used by Dillwyn at the Cambrian Pottery at Swansea and also at the nearby Ynysmeudwy Pottery. It has a bulbous body, drawn into a fine spout. There is no maker's backstamp, but from the style and pattern we have attributed it to Dillwyn. Under the spout is a minor firing crack and inside the rim a small rim chip, which has been glazed over, both would have occurred during manufacture. The rim has a few minor nicks and wear, mainly to the inside. The glaze is generally sound with just a few small patches of crazing, mainly underneath. Overall the boat is bright and clean. A most unusual piece in this fabulous pattern. Backstamp: J McD & S Co Cauldon Brown-Westhead Moore & Co Potters to her Majesty England. Cauldon England. (J McD & S refers to the retailer Jones McDuffee & Stratton Corp Boston) Light crazing otherwise excellent condition. Delightful scene on this cup with a pretty border pattern. Backstamp: Missouri CE & M. Light all over crazing to the glaze with a little minor wear to the tip of the spout otherwise excellent condition. Potting is a little uneven around the inside rim but this is inconsequential. These invalid feeding cups are always a delight and this one is decorated in the collected Muleteer pattern by Davenport. A similar cup in this design is illustrated in The Dictionary of Blue and White Printed Pottery by Coysh & Henrywood Vol I, page 135. There is light crazing to the glaze and a little roughness around the tip of the spout, plus a small hairline of approximately 0.25 inch from the rim of the cup and a little very minor wear to the handle. Overall a really lovely piece. Blue printed cartouche backstamp Muleteer, Davenport. Such a pretty piece for something with a very basic function! Floral pattern either side with a little floral detail on the inside rim. A delightful little pot, with a goat in a floral park. Stress cracks, where the handle joins the pot, which occurred during firing. There is a little surface scratching inside and on the rim there is a minor nick, otherwise excellent condition. No maker's backstamp. This is such a pretty piece - lovely shape and gorgeous pattern. No backstamp. It has light crazing,a small chip to the side of the spout, a small hairline to the rim and a crack down one side. Sounds awful but on display is a very pretty little piece. This is absolutely gorgeous! Beautifully patterned on the top, around the body, the inside rim and along the line of the handle. Backstamp: Florentine Opaque China. Provenance W A Jackson Collection with identification label. Crazed with a little associated discolouration inside otherwise excellent condition. Not to be confused with a small chamber pot! Backstamp: Mintons Genevese England. Excellent condition. Lovely feeding cup with wonderful classical buidings scene around the body and to the top and around the inside rim a gorgeous floral border. No backstamp. Light crazing with a hairline to the top otherwise excellent condition. A really lovely and unusual piece of 19th century Minton. The lid is crazed. It has a small hairline and a chip to the rim barely visible when in situ' The base is in superb condition. Not marked but definitely Minton. Delightful little pap boat with floral pattern set against a blue ground. Backstamp: Holly Hock No 7 P & A B. Crazed with some discolouration although this is mainly inside, a little minor wear to the rim and a tiny nick to the foot. Two part small spittoon with removable funnel. Humphreys Clock is a series of views depicting scenes from Dickens' stories. They are taken from the illustrations in the magazine, in which Dickens' stories were first published, and Ridgway & Co introduced a complete range of table and other wares in the 1840s, decorated with these scenes. Backstamp: Humphrey's Clock. Underneath there is a very small chip and a little wear. There is a little wear around the rim and to the handle and a little excess clay to the top of the handle. The funnel has light all over crazing with a small minor hairline and is very worn around the rim. Overall a delightful piece. Humphreys Clock is a series of views depicting scenes from Dicken's stories. They are taken from the illustrations in the magazine, in which Dicken's stories were first published, and Ridgway & Co introduced a complete range of table and other wares in the 1840s, decorated with these scenes. Pap boats were used to feed pap to invalids or infants. Pap was made from flour or bread boiled in water and apparently an egg, dash of beer, rum or brandy might be added to provide extra sustenance! These idiosyncratic survivors of another age have become strongly collected today. No backstamp. A few minor signs of age, overall excellent condition. A beautiful little piece printed in a lovely soft blue. No backstamp. A little minor surface scratching otherwise excellent condition. Very pretty feeding cup in this lovely floral pattern. Backstamp: Copeland & Garrett New Blanch and collection label W A Hackson H 4. Fine crazing with small minor manufacturing blemish to the body and touch of wear to the tip of the spout, overall excellent condition. Lovely cup printed in the lighter shade of early Tower. Backstamp: Spode Light all over crazing and there is a small hairline to the base. Resembling a very small chamber pot, this is a lovely little piece printed in the earlier light blue, rather than the very dark blue associated later with this pattern. Backstamp: blue printed Copeland. There is a little minor wear underneath and a couple of small manufacturing blemishes (thumbnails in the clay, when picked up before firing? ), overall excellent condition. A two piece spittoon or spitting pot with a funnel sitting over the rim of the mug style container. 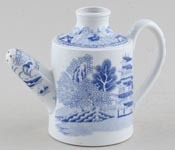 Spode and later Copeland made several styles of spitting pot, which were clearly in demand. They are difficult to find these days. The mug container has a hairline crack running down from the rim for about 1.25ins. The funnel is fine. The glaze is lightly crazed on both pieces. Blue printed backstamp Copeland Late Spode, which was in use from 1847 to 1890. Arcadian Chariots is a tantalising design. It is considered by many to be 19th Century, but when pieces do turn up they often look to be early 20th Century. Indeed, we have seen two marked pieces by Wardle, which would date from c1910-1920. Most are resolutely unmarked, as is this feeding cup, which has all the signs of dating from around 1860. The Verreville Pottery, Glasgow under both Kidston and Cochran (1833 to 1918) produced a design called Grecian, where the main scene is identical, although the border was different, rather more floral with chariot vignettes and a neat Greek key line beneath. Then early in the 1900s Cauldon introduced their Chariot pattern, again with the same main scene, but with a different classical border. Invalid feeding cups are now of another age, but are popular with collectors today; so an unusual piece and such a pretty shape. It does have some crazing to the glaze, which in some areas has taken up a little light staining. There are two small areas of visible restoration to the rim, one small restoration underneath the rim of the cover and a small firing crack in the spout which can just be seen. All in all a decorative piece, possibly Scottish, but maker unknown. Arcadian Chariots is a tantalising design. It is considered by many to be 19th Century, but when pieces do turn up they often look to be early 20th Century. Indeed, we have seen marked pieces by Wardle, which would date from c1910-1920. Most are resolutely unmarked, as is this feeding cup, which has all the signs of dating from around 1860. The Verreville Pottery, Glasgow under both Kidston and Cochran (1833 to 1918) produced a design called Grecian, where the main scene is identical, although the border was different, rather more floral with chariot vignettes and a neat Greek key line beneath. Then in the 1920s Cauldon introduced their Chariot pattern, again with the same main scene, but with a different classical border. 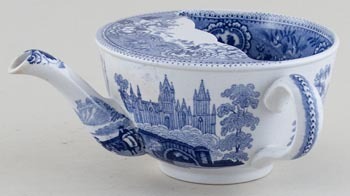 Invalid feeding cups are now of another age, but are popular with collectors today; so an unusual piece and such a pretty shape. This is unusually large for a feeding cup and is a decorative piece, probably Scottish, but maker unknown. Light crazing otherwise excellent condition. Arcadian Chariots is a tantalising design. It is considered by many to be 19th Century, but when pieces do turn up they often look to be early 20th Century. Indeed, we have seen marked pieces by Wardle, which would date from c1910-1920. Most are resolutely unmarked, as is this feeding cup, which has all the signs of dating from around 1860. The Verreville Pottery, Glasgow under both Kidston and Cochran (1833 to 1918) produced a design called Grecian, where the main scene is identical, although the border was different, rather more floral with chariot vignettes and a neat Greek key line beneath. Then early in the 1900s Cauldon introduced their Chariot pattern, again with the same main scene, but with a different classical border. Invalid feeding cups are now of another age, but are popular with collectors today; so an unusual piece and such a pretty shape. It does have some crazing to the glaze and a discreet hairline running down from the rim for about 1.5" or 3 cm. This is unusually large for a feeding cup and is a decorative piece, probably Scottish, but maker unknown. A gorgeous little piece and extremely rare in Asiatic Pheasants. The potting is quite chunky, but it is well made and printed. The glaze is crazed, but still bright and clean. No makers backstamp. A most unusual piece, superb quality and in excellent condition. Only backstamp is a brown printed potters mark. A lovely decorative piece for such a functional item! No backstamp. Light crazing to the glaze and there is a chip under the rim, otherwise absolutely fine. A superb piece. Printed in a pale blue. No backstamp. Fine all over crazing with some wear to the rim and wear and discolouration to the spout. A most unusual piece, also known as a Bubby bottle. The spout is pierced and there almost certainly would have been a ceramic topped cork stopper in the top. No backstamp. Light crazing with a couple of firing faults around the piercings and the occasional very minor manufacturing blemish. Underneath is a little discolouration and wear, overall excellent condition and a fabulous piece. Resembling a small chamber pot this is a very decorative item. No backstamp. A little minor wear to the rim and foot otherwise excellent condition. Pretty cup in this unusual pattern. No backstamp. Light all over crazing and just a hint of discolouration inside otherwise excellent condition. Two part small spittoon with removable funnel in this very pretty pattern. No backstamp. The base has two small hairlines to the rim which have discoloured. The funnel has a little wear underneath otherwise is in excellent condition. This is a marriage as the funnel and base are two different floral patterns but the funnel fits perfectly and the depth of colour the same. This is a lovely little piece. It has a couple of quite discreet restorations - one to a rim chip, the other to a rim chip and possible hairline running down from it. Otherwise it has some light crazing and a little surface scratching inside to the base. Despite these it is a lovely little piece. Pretty feeding cup with lovely floral border to the inside rim and along the line of the handle. No backstamp. Provenance label W A Jackson. Light all over crazing with some mottling inside. There is a tiny tiny hairline to the top otherwise absolutely fine. A lovely cup. The maker and pattern, so far, remain unidentified, although we have seen feeding cups and infant bottles in the same or similar design. Pap boats were used to feed pap to invalids or infants. Pap was made from flour or bread boiled in water and apparently an egg, dash of beer, rum or brandy might be added to provide extra sustenance! These idiosyncratic survivors of another age have become strongly collected today. This boat has survived undamaged. The glaze is crazed and has taken up some light staining mainly inside and on the bottom. There no backstamp, except a blue printed diamond. Invalid feeding cup decorated with a pretty floral "sheet" pattern. It is in immaculate condition and may never have been used, probably because only two of the four holes in the "internal" gate are partially clear. Two were left blocked, when the cup was made! There is a tiny nick on the end of the spout, which is glazed over and a couple of minor stress cracks where the cover meets the bowl, which all occured during manufacture. No maker's mark or backstamp. Bone china. An absolutely gorgeous piece with same rural scene either side and very pretty floral border to the cover and along the line of the handle. There is just a little very minor mottling around the foot and to the rim of the cover otherwise in superb condition. A most unusual piece in a charming pattern. No backstamp. Light all over crazing with a little minor discolouration. There are a couple of hairlines and a little loss of glaze at one end and along one side, and some damage to the central hole and spout. Overall a lovely piece. A lovely little pot, especially if you can forget the purpose it was originally made for! An all over floral pattern - white flowers on a blue background. There are some white parts showing, where the transfer has not been applied too well. It has some light crazing and there is a small hairline where the handle joins the pot. Overall though in good condition and it still shines like new! A lovely unusual piece printed in a pretty flow blue floral pattern. It is crazed and has some light associated discolouration with a little wear around the rim, but overall a lovely little piece. No makers backstamp. Lovely little piece so finely potted that it is as light as a feather! No backstamp. Light crazing with a touch of discolouration and a few glazing blemishes inside to the base. There is a tiny scratch on the body otherwise lovely condition. Lovley little piece with main Willow pattern around the body, border pattern around the inside rim and small cartouche inside to the base. No backstamp. It has a little wear and some loss of glaze here and there and a little discolouration and roughness to the glaze inside. Overall a lovely little piece.